Invitations for two to private Maritime Gallery openings, including the annual International dinner and awards ceremony, as well as free admission to our series of artist lectures and demonstrations. 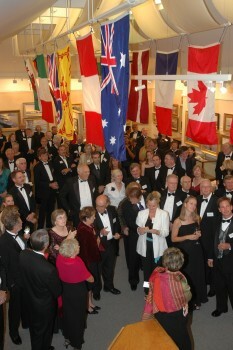 The chance to meet and mingle with world-class marine artists, as well as fellow collectors. The exclusive opportunity to purchase original artworks at a special Patron discount, before they are offered to the public. Family membership privileges at Mystic Seaport Museum, including unlimited access to Museum grounds, its annual festivals and events, a subscription to Mystic Seaport Magazine, and 10% off purchases in the Museum’s shops and restaurants. Enjoyment of our Patrons’ Room above the Gallery, as well as the Members’ Lounge in the Membership Building on Museum grounds. Knowing your contribution supports the preservation work done at Mystic Seaport Museum. Annual dues are $375. Please call the Maritime Gallery at 860.572.5388 or email gallery@mysticseaport.org for more information.